Home » Stayed or Staid – What’s the Difference? Homophones have different spellings and meanings but similar or identical pronunciations. Homophones are common in English, as well as other languages, including Japanese and Korean. Stayed and staid are two such words. Most speakers pronounce them similarly, but they mean different things and are actually different parts of speech. So which one should you use? Unlike some homophones, the choice between these two is clear: they are never interchangeable, so you will use each word’s meaning to make your choice. 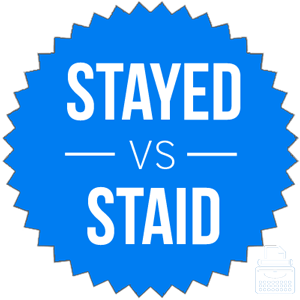 What is the Difference Between Stayed and Staid? In this post, I will compare staid vs. stayed. I will use each of word in at least one example sentence, so you can see it in its proper context. Plus, I will show you how to use a mnemonic device to simplify choosing staid or stayed. What does stayed mean? Stayed is a verb. Specifically, it is the simple past tense version of the verb stay, which means to remain in one place. Many dog owners train their pets to stay, and a poker player who does not wish to make a bet also stays. A fighter might stay his hand if he avoids giving a blow. Most of my friends went to the bar on Monday night to celebrate Suzette’s graduation, but I stayed home because I had to work the next day. If we had stayed in Florida, we might have been injured or killed by a hurricane. What does staid mean? Staid, meanwhile, is an adjective. It means stable, respectable or unremarkable. A person who is staid is not prone to fits of silliness or loud outbursts. These people would be reliable coworkers, but may not be very much fun at parties or other social settings. Janaya’s boyfriend is a staid accountant who never wants to go out with us on weekdays. The staid trail guides expertly navigated the group of terrified hikers to safety. This is a relatively esoteric word, and as useful as it is, it does not come up very often in everyday conversation. Most people would use one of its synonyms in day-to-day life. This is an easy question to answer, since staid and stayed are different parts of speech. Stayed is a past tense verb. Which word you choose depends on how you are using it in a sentence. So, what’s an easy way to remember stayed vs. staid? Since staid and the word adjective contain the letter I, remembering that staid is an adjective should be fairly easy. Is it stayed or staid? Even though these words are homophones, they are not interchangeable in any context. Stayed is a verb that means remained in the same place. Staid is an adjective that means stable or respectable. 1 What is the Difference Between Stayed and Staid?